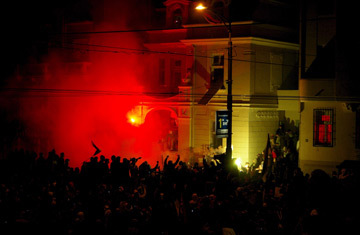 Serbian protesters set fire to the US and Croatian embassies in Belgrade. The violence at the U.S. embassy in Belgrade that left one person dead and parts of the building damaged by fire on Thursday has provoked a furious reaction in Washington. Speaking at the United Nations, U.S. ambassador Zalmay Khalilzad called the attack an "outrage," and the Security Council passed a resolution reminding the Serb government "of its responsibility to protect diplomatic facilities." The violence came in the wake of a peaceful demonstration by hundreds of thousands of Serbs condemning this week's Western-backed declaration of independence by Kosovo, which has until now been a Serbian province governed under U.N. auspices. U.S. officials openly questioned the Serbian government's lax security measures at the U.S. and other embassies, several of which have been attacked in the past week and suggested that some government ministers were inciting Serbs to violence. "We have made known to the Serbian government our concern and displeasure that their police force did not prevent this incident," Dana Perino , spokesperson for President George W. Bush said, while other U.S. officials blasted Belgrade's "completely inadequate" security precautions. Several hundred hooded protesters broke away from the 500,000-strong crowd at the rally, throwing rocks and molotov cocktails at the Croatian and U.S. embassies. Flames licked up to the second floor of the old brick building which is located in the heart of the capital. Serbian paramilitary police, arriving in Humvees, dispersed the crowd using tear gas. But firefighters later discovered a charred body in a lower room. The embassy had been largely empty at the time and US officials say all employees have since been accounted for; the body is believed to be that of a protester. While Serb officials expressed regret over the incident, and some have criticized Prime Minister Vojislav Kostunica for inciting violence, their focus remains on challenging Kosovo's secession. Branislav Ristivojevic, spokesman for Kostunica's Democratic Party of Serbia, accused the U.S. of violating the U.N. Charter and Resolution 1244 (which ended the Kosovo war but stipulated that Kosovo was still part of Serbia) by recognizing Kosovo's unilateral independence declaration, calling that, rather than the events at the embassy, "the deepest violation of international law". And U.N. troops used teargas to disperse some 5,000 Serb demonstrators trying to cross into the Albanian side of the divided northern Kosovo city of Mitrovica. At Thursday's rally, the sharp divisions that typify Serbian politics were nowhere to be seen, as leaders from across the spectrum united in a massive show of force to protest Kosovo's secession from Serbia. As banners bearing messages such as "Kosovo is Serbia" were hoisted, the country's leading politicians were joined by the likes of filmmaker Emir Kusturica. Even Australian open tennis champion Novak Djokovic beamed his support via video link. Thursday's demonstration follows a week of orchestrated outrage that has singled out those countries that have recognized Kosovo's declaration of independence . In addition to stone - throwing incidents at several embassies in Belgrade, no fewer than ten McDonald's outlets were vandalized. A local Slovenian supermaket chain was targeted as were Albanian sweet shops and bakeries. (Slovenia currently holds the rotating EU presidency while Albania has consistently supported the secession struggle of Kosovo's ethnic Albanian majority.) Serbian state television pulled American movies and sitcoms off the air and replaced them with Russian and Spanish dramas. (Spain and Russia have refused to recognize Kosovo). In the Serb-dominated north of Kosovo, meanwhile, Kosovo Serbs descended on two border posts, torching one and blowing up the other, before NATO troops from the territory's 16,000-strong peacekeeping force arrived to take control of the posts. There were no casualties. "We are struggling for what is legitimately ours. We will not tolerate this illegal act of secession," Serbian Foreign Minister Vuk Jeremic told European lawmakers in the French city of Strasbourg. Many Serbs see Kosovo as their ancestral homeland . They believe they are being unfairly punished for the sins of one man, Slobodan Milosevic, the former strongman who died in 2006 while facing war crimes charges in the Hague. And they blame the U.S. in particular for backing Kosovo Albanians drive to independence. U.S. warplanes bombed Belgrade in 1999 at the height of the campaign to stop Milosevic's "ethnic cleansing" campaign in Kosovo. At Thursday's rally, Prime Minister Kostunica asked the crowd: "Is there anyone here who is not from Kosovo? Is there anyone here who's ready to give Kosovo away?" The crowd cheered. No one volunteered. "They want us to give away our Serbian identity, our origins, our Kosovo, our ancestors, and our history. They say we'd be better off without these things, as a nation without memory and history. They say we will live better if we just forget we're Serbs and agree to be humiliated." "Without Kosovo, there is no Serbia," Tomislav Nikolic, a leader of the Serbian Radical Party said later. "Today we're all the same. Today we are one."